Our two kiddos have become obsessed with fishing. When I say obsessed, I mean it has taken over our family life. Each morning I am greeted with the question, “Can we go fishing today?” from our 7 year old son. We have purchased fishing video games, fishing books, we bid on a fishing board game from my husband’s childhood on Ebay, the DNR 2015 Fishing Regulations Guide has become our nighttime reading and our daughter pretends to be a Lake Sturgeon. Fishing is our life right now. We are blessed to have a pond right behind our home and one of the owners has graciously given us permission to fish there. This little pond is basically a kids dream fishing spot stocked with bluegill, pumpkin seed, bass and catfish! The first time we spent any time shore fishing at this pond the kids caught four sunfish, a large mouth bass and two catfish! I had never handled a catfish before and was a little leery to grab on (thanks YouTube for some quick lessons in catfish wrangling) but after a minute or two got the 22 inch beast back in the water. We are a catch and release family, and try to take the best care we can with the fish we catch and the environment we fish in. 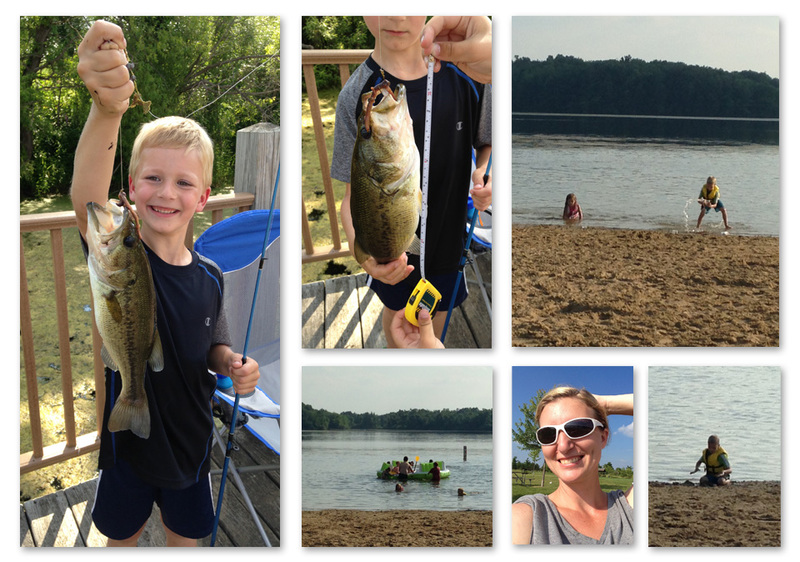 Our son would love to send in an entry to the Michigan DNR’s Master Angler program, so we regularly measure the fish we catch to see how close they are to a record. The kids just purchased new measuring tapes to take in the tackle box. Our daughter’s large mouth bass was 14 inches, and this catfish our son landed was 22 inches! In a more recent trip to the pond, I helped our daughter bring in a 26.5 inch catfish. They are well fed! Another spot a neighbor told us about is a small pond called Heron Pond at a local park we love to visit. 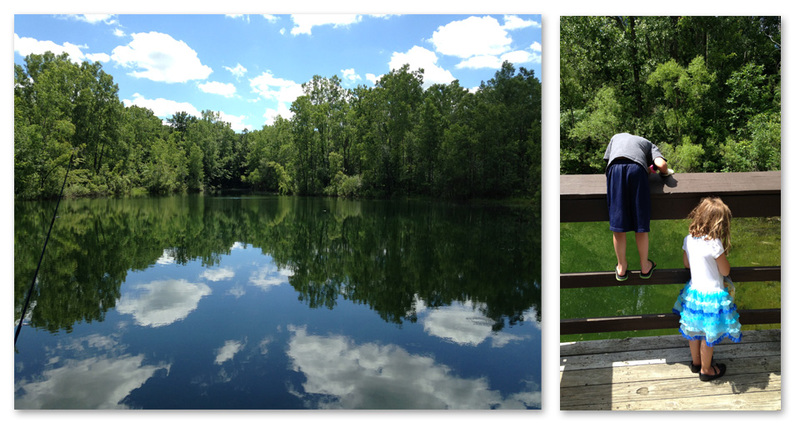 We have fished at the Burchfield Park main pond many times but just heard about this little bass pond this year. It is quiet and off the beaten path. After a short hike a small fishing pier is the only man made element on the beautiful clean, clear water. We could see the bass swimming around, but they were not interested in the worms we had to offer. We were able to catch a few small sunfish and called it a day. Last weekend I had a free afternoon with the kids so we geared up and headed north to Sleepy Hollow State Park. I have wanted to check it out for a while and we had perfect weather and traffic for the drive. The park surrounds Lake Ovid and the entire lake is a wake free zone. The fishing piers are near the boat dock in a nice weedy calm area of the lake. We brought worms and had blue gill and sunfish hit almost instantly. Our son caught his first large mouth bass. A 12 inch beauty! He reeled it in and released it all by himself. After fishing for about an hour we drove to the swimming area of the park with a nice beach area and another fishing pier. This time the kids were content chasing minnows around but wished they brought their nets. Maybe next time. We have had a couple of great trips already this summer and can’t wait for our fishing and sailing weekend coming up! To learn more about the spots we fished or the DNR Master Angler Program, Check out these sites!